The medieval chapel and the underlying rectilinear enclosure. Scale: the square on the right enclosure wall is a 1m planning grid. Photo Credit: Stephen Rees/DEFUD Archaeological Trust. 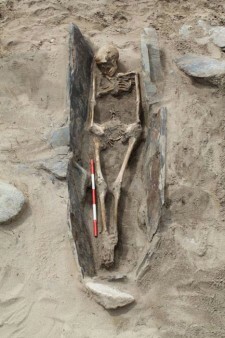 The skeletons uncovered at a Pembrokeshire burial site, in Wales, UK, probably date to the time St David was a bishop. 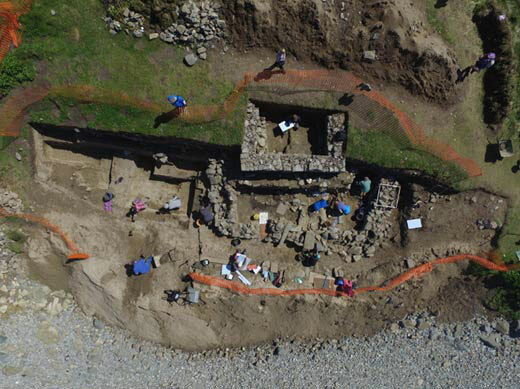 Third and final excavations at St Patrick’s chapel, Whitesands Bay, St Davids, were completed last week, revealing Christian burial sites dating from the early 6th century. That was the time when St David, the patron saint of Wales, was a bishop. 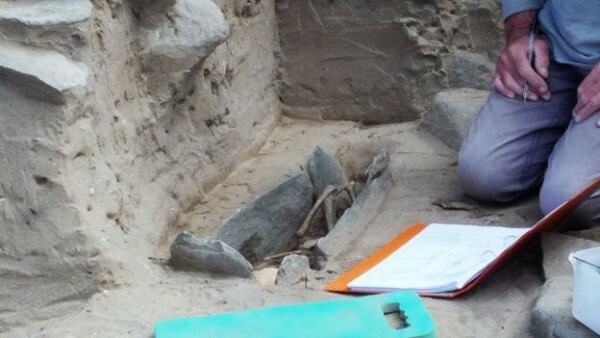 According to archaeologists, it is highly possible that some of the people buried at the plot were his contemporaries. According to Phil Bennet, cultural heritage manager for the Pembrokeshire Coast National Park Authority which supported the dig, some of them might even have known him. The origin of the skeletons has to be examined so that scientists can say with certainty where those people came from. After all, according to research by the University of Sheffield on skeletons from similar sites in the area some of the people buried there were not locals. This year’s excavations were completed last week, with specialists covering, turfing and landscaping. Excavations started when winter storms exposed graves in 2014, to prevent archaeology from being lost at sea. Since then almost 100 skeletons have been unearthed. The project is a partnership by Dyfed Archaeological Trust, Pembrokeshire Coast National Park, University of Sheffield partnership project was funded by Cadw, The Nineveh Charitable Trust and the University of Sheffield.